Here you'll find various items connected with Louise's writing—including, from time to time, some out-of-print books—and also books published under our own imprint, Dancing Mackerel. We're starting small, but the shop will grow as new items are added. We're proud to announce our the publication of our first 'real' book; a beautiful collaboration between Falmouth author and teaching assistant Penny Anne Barrett, and Louise's husband, artist Cas Sandall. Inspired by the rock pools of the Cornish seashore, it tells the tale of a sea anemone who finds a highly original way to travel, and of the creatures she meets on her journey. Penny's delightful story and Cas's beautiful full-colour illustrations make an irresistible combination that will appeal to children and adults alike. 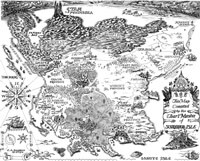 Prints of Cas Sandall's fabulous map of the Time Master world are now available exclusively from us. Created in 1995, it shows the provinces, major cities, topography and much more, all in superb fine detail. The map is in black-and-white, so you can even colour it yourself! And as an extra bonus, each copy will be signed by both Cas and Louise.